Uglyworld #702 - Giggles From The Ice Box (217-365), originally uploaded by www.bazpics.com. I was lying on the hotel bed watching Terminator Salvation on TV when I thought I could hear a feint giggling coming from the kitchen, so I hit the mute button and listened more carefully. Sure enough there was definitely giggling coming from the kitchen, so I did a quick headcount of the little guys - everyone seemed to be lying on the bed beside me. Babo's mind immediately returned to that pesky cat which has been plaguing us in recent days, so he gathered a search team and we all tip-toe'd into the kitchen to investigate the source of the giggling. Babo called his team to a silent halt in front of the freezer where the noise seemed to be coming from, and cinko then slowly opened the freezer before shouting "Sleepy Chilly", to which Big Toe replied, "Yeahs, is a freezer, so of courses it's chillies!". Cinko turned round and said, "No, looks, is cousin Sleepy Chilly Ice-Bats!!!". 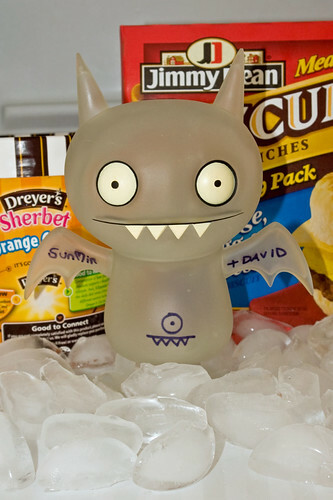 Icy had been enjoying a cold sleep in our freezer by the looks of things and then was trying to decide whether or not he should munch on one of the "biscuit" sandwiches or the orange sherbet ice-cream. Thankfully we found him before he ate the lot!